The eleventh release on the Spectrum Spools label is Soft Coast by No UFO’s, which is the work of Konrad Jandavs from Vancouver. Once again John Elliott rescues an obscure piece of music from a small-run cassette label origins, and reissues it on luxury vinyl. I like a good deal of what Mr Jandavs is doing here with his synths, beatboxes, sequencers and filters, especially those cuts which maintain a good solid beat to support the layers of droniness. In some ways it’d be nice to hear him try out the long-form La Dusseldorf thing and see what part of the melodic backwoods his Winnebago takes him, but there’s also a lot to be said for his generally economical approach here, curbing any tendencies towards wallowing in self-indulgent filtered ecstasy. No UFO’s also has an uncluttered and fresh approach to the construction of each piece, such that we’re not wading through layers of overdubbed fug; there’s a simplicity and directness which appeals, even if the melodic figures are not especially strong or original. From December 2011, and likely to grow on us with time. Now here’s a lively and spicy mixed-up morgeroon from Anders Hana, who’s a Norwegian loopoid from Stavanger associated with such fine acts as MoHa!, Noxagt and Ultralyd. Also Blodsprut, Circulasione Totale Orchestra, Clifford Torus, Crimetime Orchestra, Ingebrigt Håker Flaten Quintet, Jaga Jazzist, Morthana, and Pokemachine. Matter of fact if there’s any far-out underground music going on in Stavanger it’s fairly likely that Hana will be involved in some way, either organising the venue where it happens or tearing the tickets on the door with a surly grunt directed at all incoming punters. On the single-sided vinyl object Dead Clubbing (DRID MACHINE RECORDS DMR2), he plays all the instruments including guitar, bass and drums, adding demented saxophone noise and groany synth passages, thus performing as his own one-man stoner-rock heavy-metal beat-jazz free-noise experimental-electronics combo. When you’re in the mood for something rich, thick and zesty, Hana is the man who’ll spread hot sauce over your French fries using a trowel for the purpose. Aye, nothing less than high volume and full-intensity performances will satisfy his creative urges on this salvo of grapeshot, and primary colours are the only oil paints he’ll deign to scrape with his nine-inch palette knife. What’s not to like? Well, only the slightly clod-hoppering and clumpy dynamic of the whole LP gives it a slightly awkward feel in places, like a Sherman tank stuck in first gear or a 30-foot giant with impaired motor functions, but that’s all part of the unkempt charm of Mr “no hairbrush for me thanks” Hana. The six dense pieces are generally short, obsessively repetitive and extremely – erm – direct. The label also operates as a fine-art screenprinting joint in Stavanger, and the actual artefact (I only have a promo CD) has visuals printed directly onto the vinyl and onto the PVC sleeve. 300 copies only of this drool-worthy red pancake. 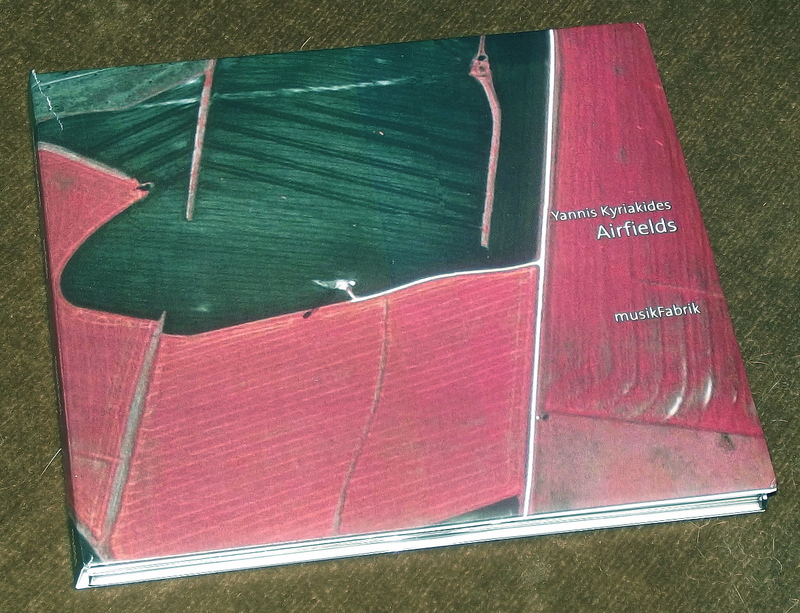 Deeply impressed by Airfields (MAZAGRAN mz005), a new composition by Cypriot genius Yannis Kyriakides which we’ve had in the pouch since December. We noted his double-CD set Antichamber in TSP19 and I think it was around then we started to find a way into this dense work with its blending of acoustic chamber music with electronic sounds and strange effects, whereas previously it had seemed a bit daunting and unapproachable. This Airfields piece, a 12-part composition played by musikFabrik, an ensemble of classical players, with live electronics by the composer, really hits home – a very interesting take on spectral music, all players producing uncanny tones and unfamiliar sounds from their carefully-woven shrouds of woodwinds, strings, piano and percussion. In his notes, Kyriakides tells the story of how the piece came to be, and it’s a tale that involves a composition for the Siren Orchestra (who derive ideas from the futurist Luigi Russolo and the scientific theorist Heimholtz), and another composition for the Seattle Chamber Players. Since 2008, Kyriakides has been developing his own form of unusual graphic scores, working with photographs taken by satellites which he manages to recast into sonic information. As that technique improved, he found ways to render parts of these graphic scores by hand, translating the contours of these aerial views into scores which musicians could read. I like the idea that the musicians playing this unconventional sheet music are “put into a metaphorical orbit”, and it’s no doubt this methodology which accounts for the unusual, dizzying sensations of Airfields – sometimes we feel we are indeed falling through the sky in a semi-controlled way, taking a reverse parachute dive into another dimension. It’s entirely subjective, but I think this compelling and strangely melancholic music would make a perfect accompaniment while viewing Le Drapeau Noir, a 1937 painting by René Magritte. Further ghostly timbres arise in this, the third version of the evolving concept, through his placement of the brass section on the balcony of the performing space, to assist with the natural echo of the other musicians on the stage (a radical rearrangement of orchestral convention of which I’m sure Stockhausen would’ve approved). 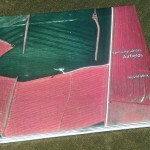 A live recording made in Amsterdam, the disc is issued with a booklet of full colour photographs.